A few years ago, researching a novel, I visited Washington DC. Since the novel is about swashbuckling journalists, I of course entered the lobby of the Washington Post. 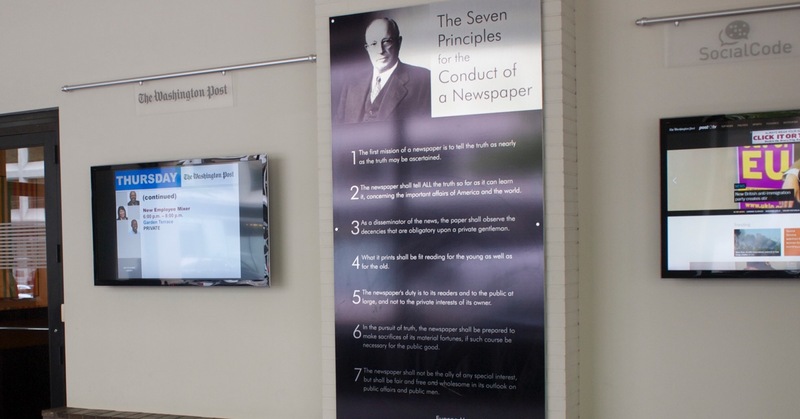 At the entrance is part of an old printing press, and this code of conduct for the press. I understand that the Post has since moved to another building; I expect they sent the code to a museum in the move, because every item on this list that isn’t outdated has been ignored for decades. 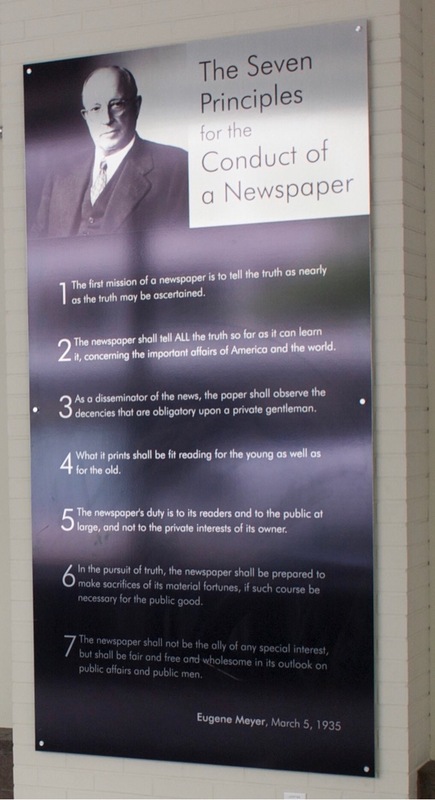 The newspaper’s duty is to its readers and to the public at large, and not to the private interests of its owner. Eugene Meyer founded the Post—I learned this from David Halberstam’s gigantic The Powers That Be. Meyer bought it in bankruptcy and built it into the powerful newspaper it is today, before handing it (and his daughter, Katherine) over to Phil Graham. Some of the rules are still followed, if you add “in the beltway” to the end. The paper still observes the decencies that are obligatory upon a private gentleman in the beltway. That is, while scandals, and even non-scandals, about conservatives are newsworthy national news, scandals about Democrats are private affairs, local news at best. And, in support of beltway truthiness, the newspaper remains prepared to sacrifice its material fortune when necessary for the good of the beltway. And much of its opinions are beltway childishness at best. A few years ago, I received an old TV Guide from 1981 as a gift. There were a lot of fun things in it, such as Bosom Buddies, giant murals of flying horses through rainbows, the sort of stuff you expect from the late seventies and early eighties. 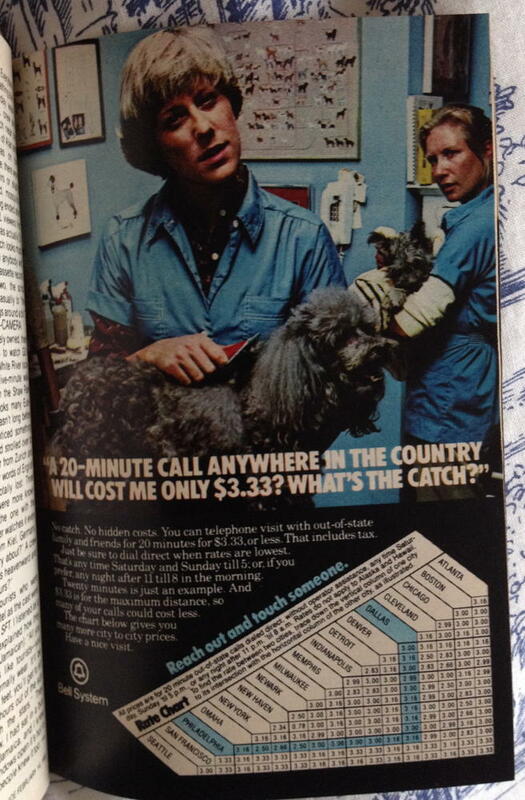 There was also this ad from AT&T’s “Bell System” touting the incredibly low price of $3.33 per twenty minutes. In 1981, AT&T had a monopoly on phone service. That $3.33 per 20 minutes is, according to the Bureau of Labor Statistics inflation calculator, $8.83 per 20 minutes, or $26.49 per hour. And read the fine print: that’s just the off-hours cost. That’s any time Saturday and Sunday till 5; or, if you prefer, any night after 11 till 8 in the morning. Today, even on AT&T, you only pay $1.40 per 20 minutes1, and you don’t have to worry about peak vs. off-peak hours. That’s if you still have a land-line. More likely, if you have a cell phone, you don’t even worry about minutes anymore. I remember having to time my long-distance calls home in order to avoid incurring the “peak rate”: calling early in the morning, usually, because my parents went to bed before 11 PM, then remembering to say goodbye before 8 AM. AT&T was a government-sponsored monopoly. I can just barely remember when we weren’t even allowed to plug in our own phones. I remember being happy that I could find an inexpensive “Conair” telephone when I was in college, so that we could have a phone in our apartment. July 20, 2016: Democrats endorse public school elections, teacher recalls? I recently saw an odd meme on Facebook that both illustrates the poor state of education among the left today, and suggests an interesting idea for improving public schools that does not involve vouchers. 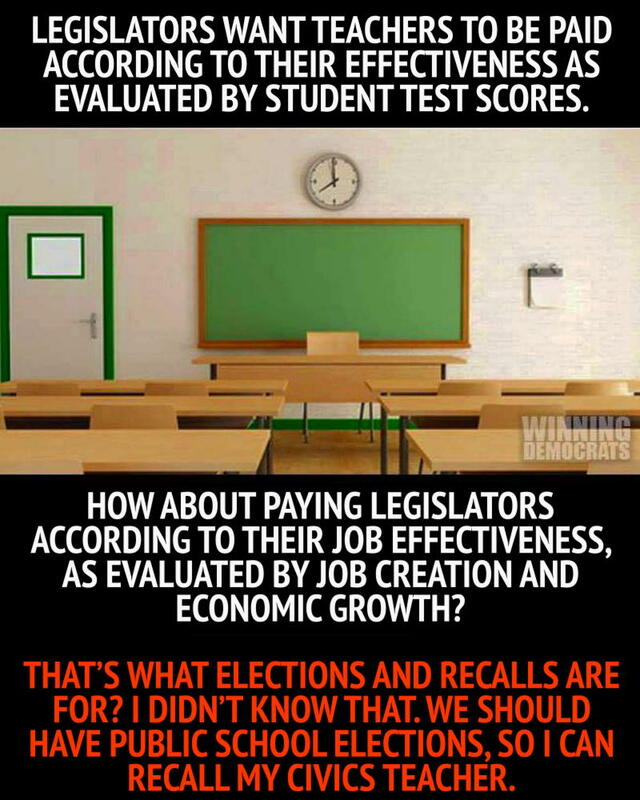 A group called “Winning Democrats” started a meme calling for treating legislators and teachers the same when it comes to measuring job performance. Making teachers elected and recallable is an interesting idea. Legislators want teachers to be paid according to their effectiveness as evaluated by student test scores. How about paying legislators according to their job effectiveness, as evaluated by job creation and economic growth? They don’t seem to realize that such a method already exists for legislators: elections and recalls. Their ignorance is probably a reflection on the poor state of Civics instruction in the government-run schools they attended. But the idea is worth thinking about. Attempting to measure teacher performance is an understandable attempt to mimic a free market; but government always fails when it tries to fake a free market. Any rules put in place to pretend to be a free market end up being gamed by those taking part in the system, usually the administrators on both ends of the system. We saw this in California’s power exchanges, we see it today in the federal insurance exchanges, and we see it in all of the corruption attendant in trying to hold government schools accountable for the education they provide. In a sane school system, parents of children who were not being served well by one school would simply take their children to another school. Teachers who failed to serve students well would be out of a job, or relegated to less remunerative non-teaching roles; any school that retained poor teachers would go out of business. This, of course, already happens in private schools, but because most people can’t afford to pay twice for their children’s education most parents cannot use private schools. For most parents, there is only one option for school just as there is only one option for government: the government-run school that their tax dollars pay for. Rarely has there been a less self-aware meme than this one. It shows two real child molesters who molested young girls, and then a photo of Dr. Frank N. Furter from The Rocky Horror Picture Show and the caption “Not a child molester”. And the left uses it as an argument in favor of letting all three into bathrooms, pretending that the first two will self-segregate themselves from taking advantage of the new policies, and that the third is the hated target of those who oppose men in women’s restrooms. But even assuming that Furter’s initial dealings with Eddie were all above board2, and that Furter would have respected the boundaries of any children he met in an isolated location, Furter raped Brad and Janet, he murdered Eddie, and then he served Eddie for dinner. Good old Microsoft and their apocalyptic view that we would never reach the year 2000! I just acquired this old Model 100 and it works pretty well. 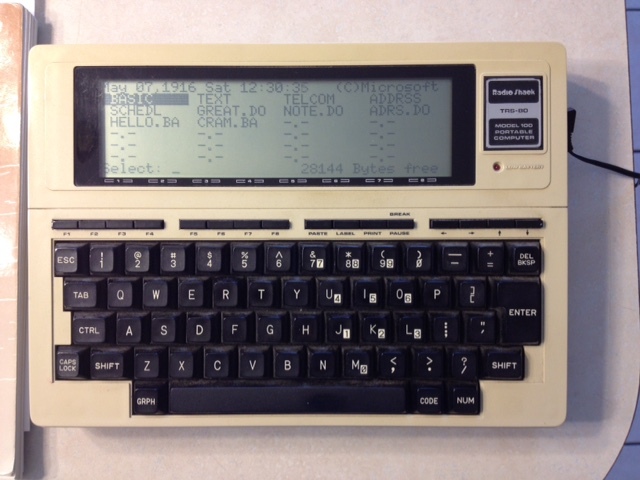 I love the address book and scheduler. They are literally just text files, edited using the word processor function, and searched using a simple search tool. There is a lot to be said for text. 2016 in photos last modified August 23rd, 2016.